Description: This LED strip light adopts a kind of super flexible PCB board as a base. The LEDS are evenly arranged on the board. Each ribbon could be connected together via mini waterproof connectors. The whole ribbon is as transparent as crystal when it is lit up. It is a kind of waterproof horizontal ribbon. The luminous body is of very high intensity, large viewing angle, good quality and stability. Three LEDs make one group and each group can be cut according to the length requirement. The ribbon is matched with wiring bridge in the middle of it, this design makes the ribbon can be easily connected after cutting, and you needn&amp;amp;amp;amp;iexcl;&amp;amp;amp;amp;macr;t weld wire as usual. Special waterproof materials ensure the ribbon could work normally when temperature varies largely from -20&amp;amp;amp;amp;iexcl;&amp;amp;amp;amp;atilde;C to +40&amp;amp;amp;amp;iexcl;&amp;amp;amp;amp;atilde;C. It characters as easy for installation, stable, and energy-saving. 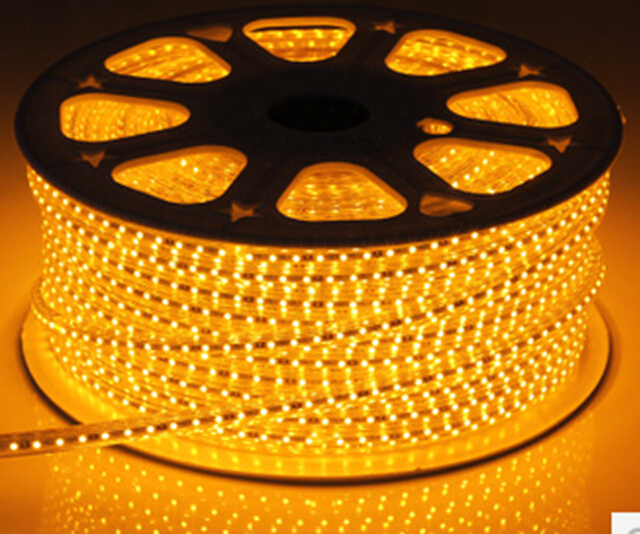 It is really an ideal lighting decoration product for both indoor and outdoor, such as edge decoration, stair decoration, car decoration, small floodlight, etc.Package is 100M/ROLL.